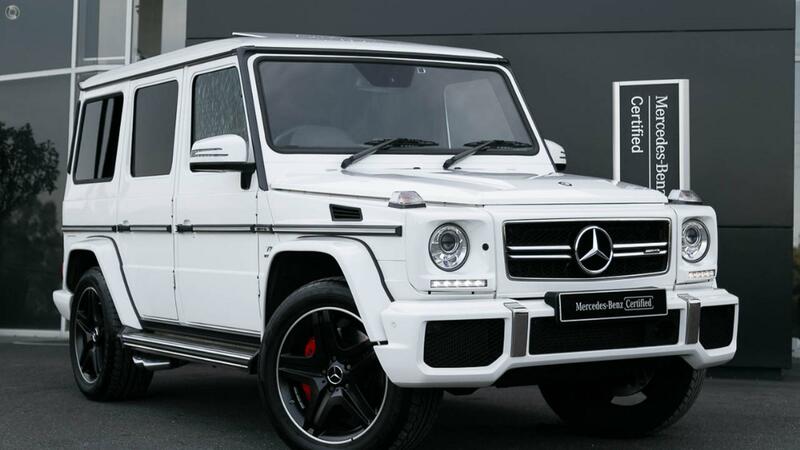 Australia's Most Awarded Mercedes-Benz Retailer proudly presents this iconic one-of-a-kind Factory-Certified Mercedes-AMG G63 Bi-Turbo "designo Exclusive Package." Highly specified in the stunning combination of Polar White with designo Two-Tone Porcelain & Anthracite Leather trimmed with designo Champagne White Piano Lacquer Wood riding on 20" AMG 5-Spoke Light-Alloy Wheels painted in Matte Black with a high-sheen finish. Take the wheel of your incredible Mercedes-AMG G63 "designo Exclusive Package" with absolute confidence - ONLY from a Certified Mercedes-AMG expert and the reigning Mercedes-Benz Metropolitan Retailer of the Year again, for the 5th time in 6 years! - Two-tone designo Leather upholstery with diamond pattern (seat, door centre panel and rear door panel). - "V8 bi-turbo" lettering (badging) on vehicle sides. - THERMATIC automatic climate control with two zones. - Windscreen washer nozzles heated. - 322 g CO2 p/km. Interstate enquires warmly welcomed; we will organize your Mercedes-Benz transported directly to your door, making it the simplest of processes. Do not miss out on the car of your dreams for the sake of a little distance! With four on-site Business Managers for all your Finance & Insurance needs and a dedicated Professional Vehicle Appraiser we ensure we maximize your trade-in valuation and financial benefits.